Every Christmas morning we wake up, throw the egg casserole we made the night before into the oven, and open presents as it bakes. It's a filling breakfast leaving your stomach full until another big meal later on in the day. 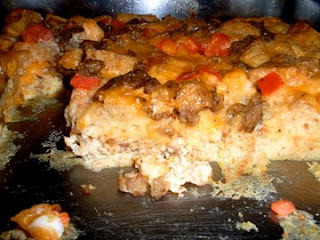 We've been making Jimmy Dean's Breakfast Casserole a couple years now and although I'd like to add in some more veggies, it's a good base recipe.